Kiddimoto has new 3 wheel kick scooters for kids that are now available in the US called the U-Zoom. Some of you may be aware of a neat balance bike company from the UK that got their start making wood balance bikes that resembled motorbikes. Since 2003, Kiddimoto has expanded their offerings to metal balance bikes, scooters, helmets, accessories, ride-ons and more. There are so many kids kick scooters on the market. In the 3-wheel category you have offerings from some of the more well-known companies like Micro, Ybike and Razor and now Kiddimoto. Of the models listed above; only the Kiddimoto U-Zoom is a true fold-able 3 wheel scooter for kids in the 3-5 year old range. In addition to being a fold-able scooter; the scooter is incredibly lightweight thanks to its plastic footplate and aluminum stem. Adjusting the handlebar height is as easy as pressing the plastic button mechanism and a release clamp. The Kiddimoto U-Zoom is a breeze to control because of the easy lean steering mechanism coupled with a rear wheel foot brake to make sure your child doesn’t lose control when they are out and about on their adventures. 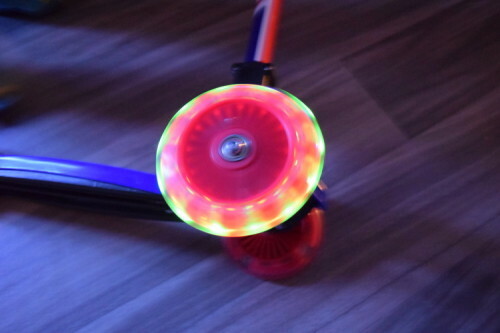 Your child will be even more surprised when they see the wheels light up! Pay a visit to Kiddimoto USA’s website to see all the cool ride-ons and scooters they have to offer. This entry was posted in Scooters and tagged 3 wheel scooter, kiddimoto, kids scooter, light up wheels, scooter, u zxoom, uzoom. Bookmark the permalink.